Royal College of Art student Joy Bonfield-Colombara has funded her way through art school by creating a hand-carved effigy of Lil Wayne in solid 18 carat gold with diamond tears, for the American rapper. 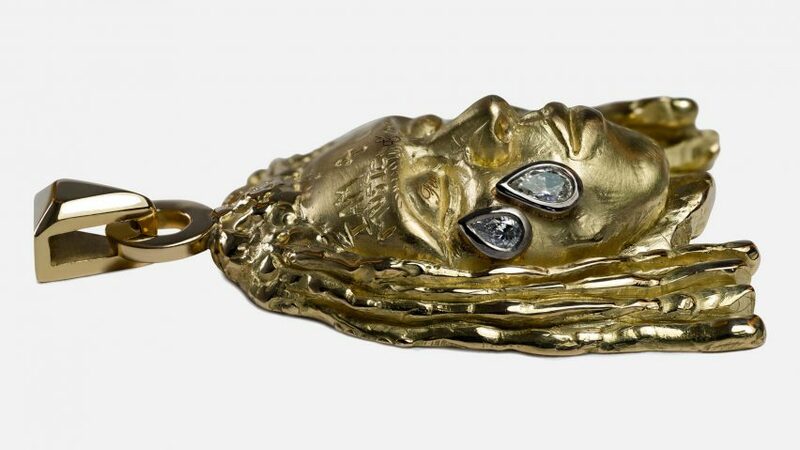 The London-based goldsmith, who goes by the name Joy BC, was commissioned to create the one-of-a-kind piece by a friend of Lil Wayne to mark the rapper's 36th birthday, as well as the release of his latest album Tha Carter V.
The pendant, titled An Icon, takes the form of Lil Wayne's face suspended on a gold chain, made from 18 carat gold and engraved with miniature replicas of his distinctive facial tattoos. The rapper's tear tattoos, which represent the deaths of people in his family, are illustrated as teardrop-shaped white diamonds, set into the gold face. In addition to helping her gain more recognition for her work, the commission of the pendant has also helped BC financially, allowing her to pay her university tuition fees. "This year I was seriously considering dropping out of school because I couldn't afford the fees," she said. "The commission came a few weeks before I was due to start my second year, and meant that I could pay for school and continue to pursue the career I am so dedicated to." The piece draws on BC's interest in ancient and classical artefacts that have been purposefully broken or deconstructed over the years – her work typically references fragmented statues of gods and goddesses. According to the goldsmith, these imperfections aim to evoke the feeling that each piece has a history or past narrative, and she continued this concept when making An Icon. "If you look at the bottom of the neck, you can see that there is a rough edge as if the head had been broken off its body – like many ancient sculptures this happens either over time, or from people trying to steal them," she explained. The rapper's portrait shares close similarities with a series of rings that BC designed earlier this year, called Precious Tears, which feature hand-carved fragments of faces with colourful precious stones embedded into them. BC wanted these rings to "celebrate the tear drop" and explore the social stigma attached to showing emotion and vulnerability, especially as a man. She felt that there was an "accidental and beautiful correlation" with a song on Lil Wayne's latest album called Don't Cry. "Growing up I had a lot of close male friends who suffered with depression and felt like they couldn't talk about it," the artist told Dezeen. "I wanted to explore mental health and this perception of vulnerability as a negative thing." "There is a negative stereotype that for a man to cry shows weakness," she continued. "I seek to reclaim the power that can be harnessed in the simple and often moving act of shedding a tear." "I became really interested with the concept of tears and how, in fairytales, a person's tears are often used to save the life of someone in need – it's like this sacred act in which something changes." BC's Lil Wayne effigy also took inspiration from religious iconography, specifically images and symbols of Jesus, which are often associated with hip hop culture. She adopted the ancient method of lost wax casting to create the piece, which sees molten metal poured into a mould that has been carved from a wax model. Once the mould is made, the wax is melted and drained away. The American rapper can be seen sporting the bespoke pendant in his new music video for the song Uproar. Icelandic designer Katrin Olina also adopted the age-old lost-wax method to craft a range of jewellery that looks like gothic talismans, while Cape Town artist Atang Tshikare used the technique to create the hand-sculpted bronze frames of otherworldly tables. Photography is by Daniel Riley.